There is absolutely no denying the fact that we all want to cook a little better and reduce the fat in our foods. However, this is not always possible and most fryers add a massive amount of calories to our favorite meals. With these calories, it becomes really hard to lose weight and we can all resonate with the hardships of losing stubborn weight once it has been gained. In the modern era, life is busy. We run from one meeting to the next, only wishing for the day to end to get home and kick back. However, cooking is one of the things we cannot really avoid and we always try to do this chore in the littlest amount of time. This also leads to many “junk food” ventures we undertake. Eventually, it will catch up with you and you will see massive weight gain or even a couple of health issues. The Secura TXG-DS15 Airfryer is a God sent savior to the modern generation. 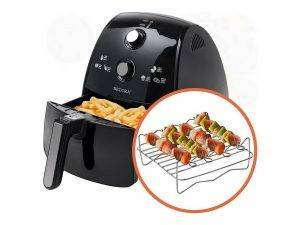 It claims to reduce the number of oils in the foods and ensures the same flavor you are used to from your normal fryer. 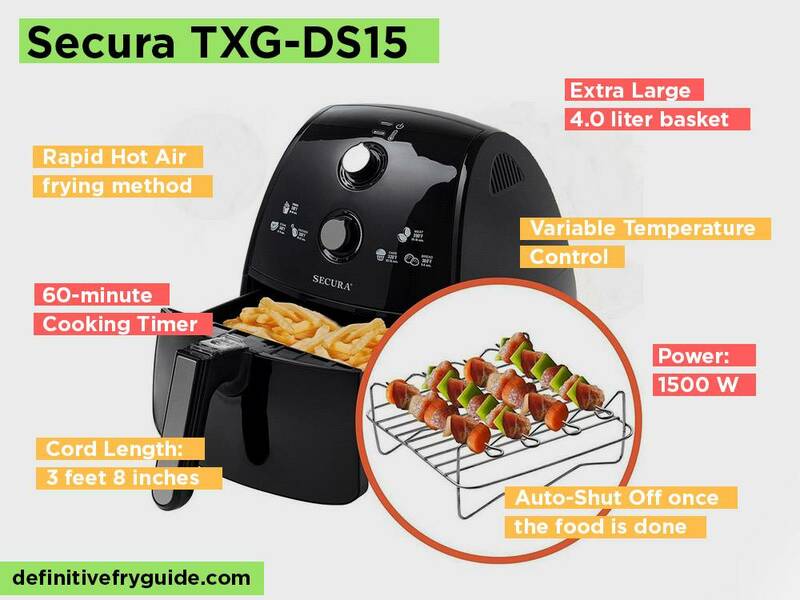 In this article, we discuss the Secura TXG-DS15 Airfryer and take a deeper look into many of the features. If you like to find out if this fryer is for you, continue reading this article. The Secura TXG-DS15 is a durable option designed for everyone. It is one of the latest releases and the fryer includes many of unique additions that you might find helpful for certain situations. Since it is available in different sizes, you can find the right one for you and your family. Most of the features are already included, saving you a couple of bucks. These features might seem a little technical to you. To help you understand a little better, we have broken down some of these features into real benefits that you can expect. These benefits have been proven by many people. Here are the top benefits that most users of this Air fryer lover bragging about: different sizes, timers, multiple accessories, powerful motor, healthy meals and simple cleaning process. As you buy this air fryer, you will need to choose between the different sizes that are available. Compared to many of the other air fryers on the market today, the capacity is definitely a little larger and the 4-liter capacity perfectly proves this point. However, you should look at all of the sizes and choose one according to the needs of your family. One misconception that we have seen with many people is that they think the larger version will take longer to cook. However, the fact of the matter is that all of these sizes will cook your food in the same amount of time and they will shut-off once the food has been perfectly cooked to your specific needs and preferences. Once you get home from work, you are generally stressed and it quite a rush to complete everything that needs to be done for the evening. Once the attention is all over the place like this, it is really easy to completely forget about your food and have it overcooked. 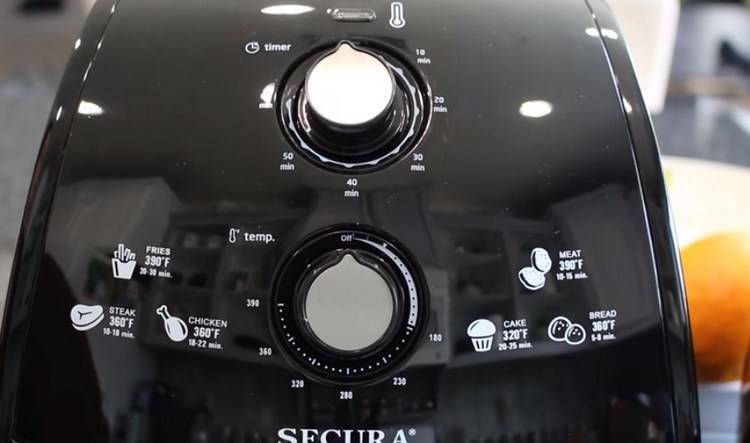 Fortunately, Secura features a couple of timers to help you with the cooking process and to keep you notified at all times. The 60-minute timer is great for checking on the food in different intervals. This does not mean it will only notify you after 60-minutes no, it means you can change the settings on the timer to notify you at a certain time. We found this to be really helpful to many busy families and especially single mother who need to also help their kids with homework after work. As we have also mentioned, the auto-shutoff timer is another great feature that helps many people when they are in a state of rush. Once your food has been cooked to the specific temperature you desire, the fryer will automatically shut off. Yes, this does mean that you can use the control pad to directly determine how long you want to cook the food. Most air fryers come with standard features that enable you to cook a couple of different meals. However, the Secura TXG-DS15 is a package deal. 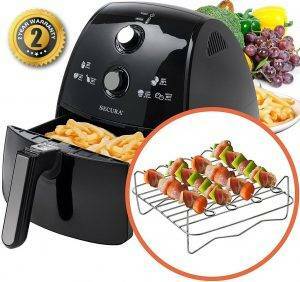 In this package, you will receive a couple of great additions like a toaster rack and multiple skewers for a different take on foods. The toaster rack is not made for toasting your bread, but rather toasting some of your meat to have a char-grilled flavor that you occasionally have on the barbecue. If you have a couple of problems with the right spices and how to cook the food, Secura has included a state of the art basic recipe book. Using this will enable you to easily get started and cook a couple of your favorite meals without too much trouble. Talking to a couple of people, we have seen that not everyone really cars about the motor that is used. Fortunately, Secura does not try to undermine your intelligence or take advantage and they have a included a powerful 1500-watt motor. This motor might not mean much to the untrained eye, but if you are looking to cook faster, the motor will help you accomplish this task. Thanks to the powerful motor, the air fryer can reach temperatures of up to 370 degrees Fahrenheit. This is more than enough to cook fish slowly and thoroughly, improving the overall taste, without having to worry about the fish burning or even being stuck to the grill. French fries should only take a couple of minutes to be cooked in a healthy way. Cortisol and estrogen are two of the worst things that we take in during a day. While estrogen is actually a good thing when regulated, most junk foods will spike estrogen and increase cortisol. As we all know, cortisol is the stress hormone, leading to anxiety and even insomnia in many people who have been dealing with it for years. Compared to massive chain stores, the air fryer makes use of a less oil on your foods. You won’t need to add as much oil to the meals and this enables the meals to actually come out much healthier. We also found that adding olive oil is not such an expensive endeavor anymore and you can now cook all of your meals with extra virgin olive oil. The dreaded cleaning part is something we don’t always look forward to. Washing all the dishes and the pots and then running through the kitchen can eat another chunk of time that could have been used for relaxation or working on your future. 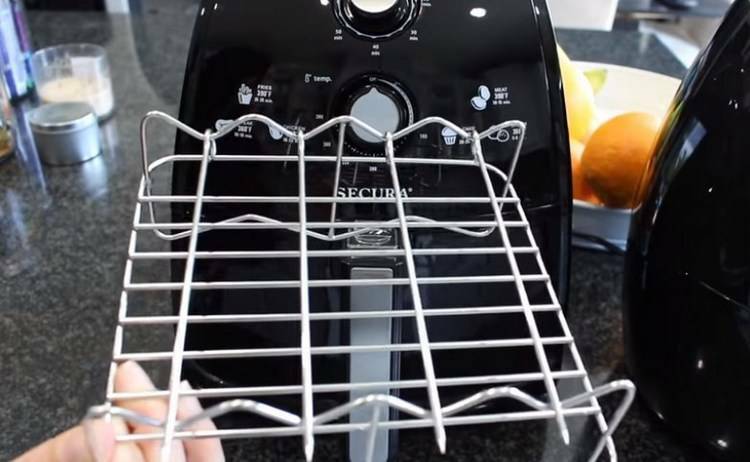 Fortunately, this air fryer is simple and effective to use and it can actually be cleaned in your dishwasher. Not all of the parts are dishwasher friendly, but most of the add-ons are. Additionally, there is no real mess in the kitchen. I find this really beneficial and only cleaning one specific cooking appliance is much easier than having to clean the burner and the oven as well. It is definitely one of the ultimate time savers on the market today. 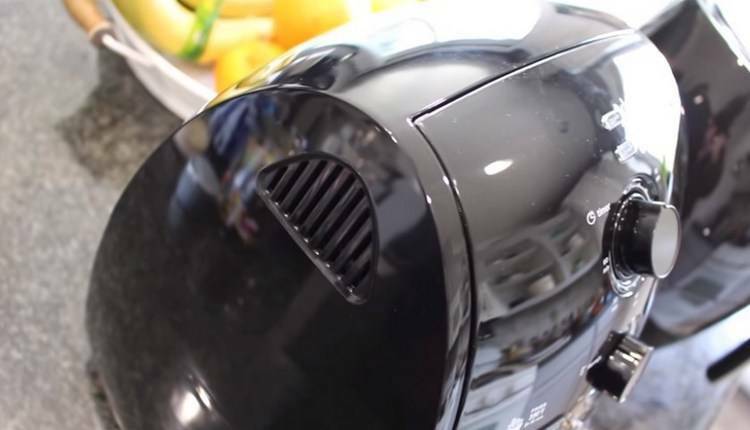 After scouring the web, we found a lot of comments from people on this air fryer. However, we did ask someone who has personally used the product. After a couple of demonstrations, we could see all of the features and some of the weaknesses. We also tried many different food types to see if it can actually cook everything. The truth is, the air fryer can cook virtually any meal that you might desire. The instructions are clear and they will tell you exactly how much oil needs to be added and the temperature you need to use for cooking any specific meal type to perfection. Which Alternatives Can You Choose? 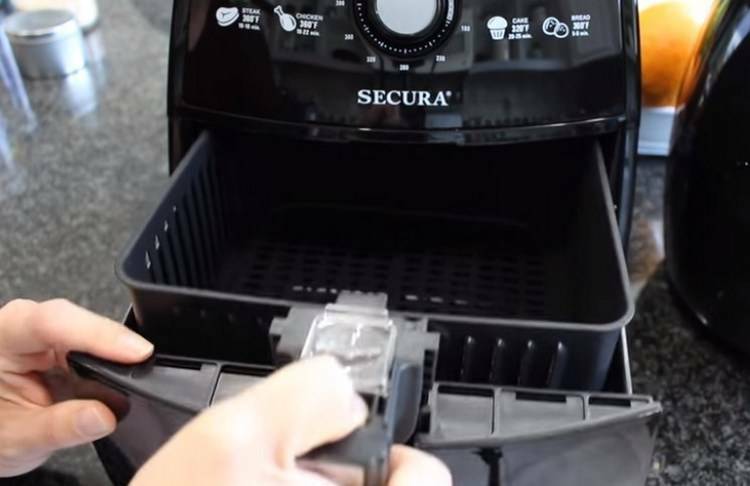 Secura is an excellent brand and they have designed air fryer on many of the past failures and with diligent research, this air fryer is considered one of the top options on the market today. However, if you are looking to try something else, here are a couple of alternatives that you might like to look into. The GoWISE USA GW22731 is a slightly larger air fryer and it is also really affordable. Since it has been FDA-certified and you can find it in numerous different colors, this air fryer should make a massive difference to your life. It is worth noting that the price is really affordable as well. The Cozyna Air Fryer XL Touchscreen is one of the modern air fryers. The console and display is state of the art and this will make a massive difference when you need something stylish. However, the air fryer might be a little more expensive. It is also large enough for you and your entire family to cook with ease. We would also recommend the Philips HD9621/99 for all the durable features and many of the stylish upgrades. It includes a cookbook and numerous presets to simplify your cooking experience. On the downside, this air fryer is one of the most expensive options on the market today. 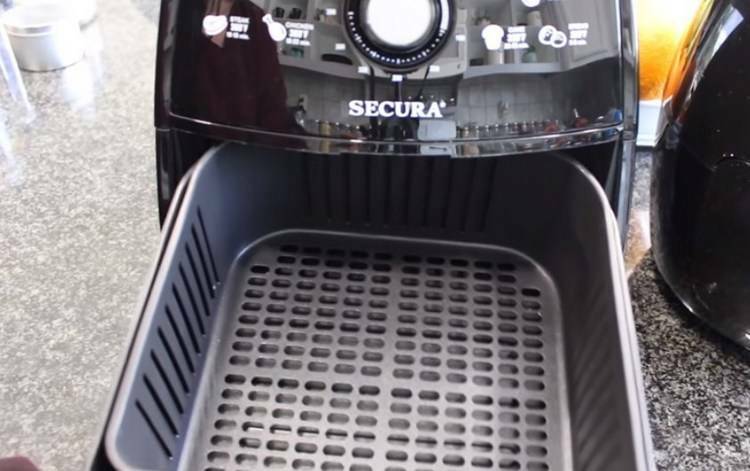 Do You Believe The Secura TXG-DS15 AirFryer Is A Great Buy? Solving the problem of time and helping you with the struggle of weight loss is possible with a state of the art air fryer. If you believe in eating healthy and you want to make radical changes in your life, this will be one of the best options to choose from. Since it is really small and easy to clean, the air fryer will save you a lot of cleaning time, while the large interior will cook for the entire family in one go. 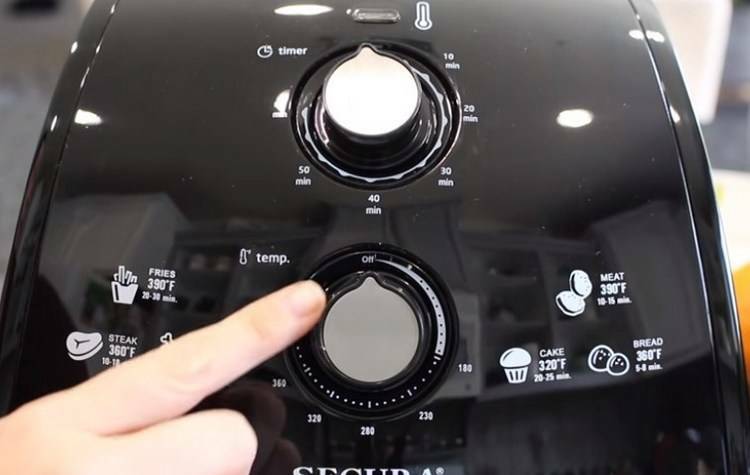 Now that you have seen the Secura TXG-DS15 Air fryer review, we would love to read some of your comments on this product. We always love reading your comments in the comment section below and we would like to hear some of your thoughts. If this I the perfect air fryer for your needs, simply click here and you can have it.